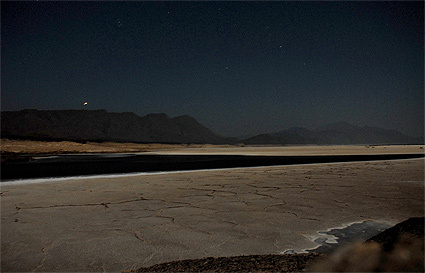 This evening finds us camping on the shores of Lac Assal, a body of water 90 kms out westwards from Djibouti town that is in the process of drying up. This marks the first day of the 15th out of a total of 16 legs of this circumnavigation attempt. Our departure out of Djibouti town was quite unceremonious with several groups of children using Kenny and I as target practice for fine tuning their stone throwing skills. As nomadic people they no doubt spend much of their day throwing rocks at dogs and other potential predators to the herds of goats and sheep in their charge. And we clearly appeared as irresistibly slow moving targets. At one point I made the mistake of yelling at one kid who jumped onto my BOB trailer for a free ride. In Asia a sharp retort would quickly nip such behaviour in the bud. But in Africa there is clearly a different protocol that is required, as within seconds we were beating a hasty retreat under an artillery barrage of good-size rocks flung by at least a dozen of the little brutes. If any of these should have hit us in the head we would have been knocked off our bikes for sure. I get the sense that while violence is taboo in most of Asia, or at least in public, in Africa its a different story; the people, at least in this region (predominantly Somalis and Afars) have shorter tempers and are ready to fight at the drop of a hat. By tomorrow evening we should hit the Ethiopian border and start climbing out of this impossible heat (Lac Assal is 150 metres below sea level, and correspondingly hot) and up into the relative cool of the Ethiopian highlands. - Jackie and Jean Bernard, Djibouti, $250. We're back in business for video again - click on the image above the view recent footage Kenny took of Moksha being pulled out of the water onto dry land. You'll need quicktime and a relatively fast internet connection. This is in anticipation of shipping her back to Rotterdam in a 40 foot container ready for the final crossing of the Channel and up the River Thames to finish at Greenwich. African leg starts by bike tomorrow at 7am. 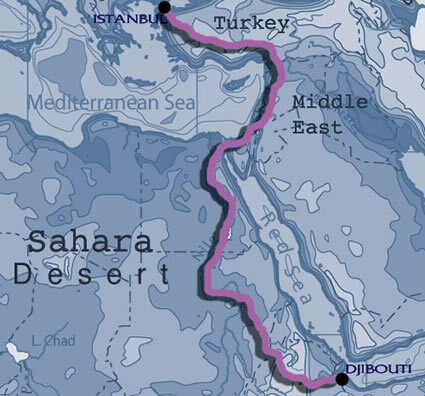 Starting this coming Friday morning (30th) the next leg, the 15th out of a total of 16, takes the expedition through Ethiopia, Sudan, Egypt, Jordan, Syria and Turkey. The final leg through Europe will end around the middle of October at the Greenwich Meridian Line in east London where the whole thing started over 13 years ago. The main concern of course is the Sudan, and in particular crossing the border between Sudan and Egypt across Lake Nasser. This will most likely involve using a kayak to paddle the 180 miles between border checkpoints. The big unknown at this point is whether it will even be possible to either acquire a permit to do so or just wing it on the day by sweet talking local border officials. If unsuccessful there are, to the best of my research, few if any alternative route options, and the possibility exists of backtracking as far as Mumbai in India to negotiate an overland route across Pakistan and Iran to reach the end goal of Europe. But as with the border crossings between East Timor and Indonesia and crossing Tibet without permits, there may well be key people lying in wait up the road in the future to help facilitate what seems at the present time to be a very slim chance of success. So the main thing is to forge ahead regardless. A few days ago we visited the Decan Cheetah conservation area just outside Djibouti town. Currently home to six cheetahs, the refuge was set up by Dr. Bertrand Lafrance to protect the animals from being killed by poachers. 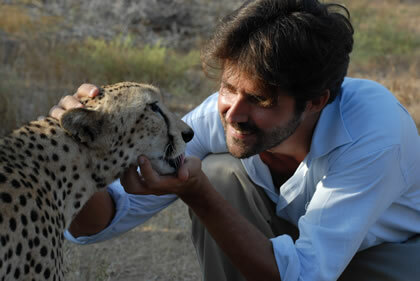 At one point we were offered the unique experience of entering the same enclosure as 'Tesai', a seven year old cheetah who appeared quite tame and tolerant of being handled by Bruno, our local guide/come guardian angel here in Djibouti*. In July 2006 she gave birth to three cubs in captivity, a highly unusual occurrence for an animal that normally requires enormous distances to roam around in for the dating game to actually yield results. But all three died due to the extreme heat. Tesai will never leave her enclosure as her skin will quickly sign her death warrant for its value on the black market. But plans are in place for any progeny to be released into larger fenced areas that hopefully ensure both protection from poachers and offer a little more freedom of movement. Since arriving Sher and I have been staggering around like a couple of drunks, barely able to perform the most basic of tasks such as climbing stairs, walking in a vaguely straight line and standing for more than 15 minutes at a time without having to collapse into a chair. Our body physiologies have changed dramatically to reflect the limited range of movement we had over the course of 47 days just pedaling. Not having walked or even stood for so long we have lost large areas of muscle mass in our upper body areas, in particular along our spines and backsides. Sher weighed himself yesterday and he's down from 182 to 148 lbs. Consequently all we want to do is eat! Kenny has still yet to do final interviews for the documentary series so we're forbidden to cut our facial hair (to keep the visual continuity) with the result that people we meet are constantly looking behind us for our handlers. But, as we're fast finding out, Djibouti is a backwater town that is home to a complete mishmash of cultures and misfit characters that wouldn't survive elsewhere in the world. Needless to say the expedition fits right in. The predominantly French ex-pat community is very close knit with everyone knowing each other well. Fortunately the hotel we're staying in is managed by a very colourful character - Bruno - who has been bending over backwards to create opportunities and make introductions to key players in the local community who might be able to assist with the myriad of things that need to be done, such as pulling Moksha of the water and finding a place for her to be stored before being being shipped back to Europe. He's the kind of person that holds the keys to opening doors that could otherwise take weeks of blundering around on one's own. We are extremely grateful for his efforts thus far. The first impressions of Djibouti are that it is very hot and is EXTREMELY expensive. A small glass of beer is 6 US dollars for example. But there are cheaper places to eat and get things done apparently. The trick is to cross over from the European quarter into the African quarter where prices automatically drop by 2/3rds. As the rigours of the voyage start to wear off our thoughts are naturally turning towards what comes next. Sher and Nathalie will be flying out on Friday to return to their jobs in San Jose and Belgium respectively. 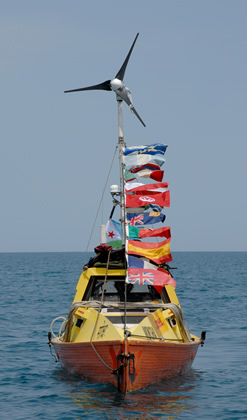 Nathalie will be a key person in the closing stages of the trip: Moksha is being shipped back to her home down in Oostende and stored safely there until the final crossing of the Channel to England in late September this year. Kenny will bike with me for the first section of the next leg which involves biking through Ethiopia, Sudan, Egypt and the Middle East. Tomorrow we head to the Ethiopian consulate to apply for visas. Then there will be at least another week of logistics, centred mainly around getting the boat ready for export, before we can head off. In addition to the people who have already helped so far I'd like to take this opportunity to that the sponsors of the last leg who contributed with financial underwriting, product and services support. I believe Sher will be also posting his last update tomorrow. Arrival is imminent! We rendezvoused with Kenny and his support craft at 0900hrs this morning, and Sher is closing the gap to the finish line as I write this. We'll put together a bigger update later today. But in the meantime HUGE thanks to all who have been working behind the scenes to expedite the logistics and safety of the voyage, in particular my father, Cyrus Heerjee and Mr Rajan from the Royal Bombay YC, Kenny Brown, Nathalie Lauwerier, Bruno from Dolphin Tours and Alain Martinet in Djibouti. Personally I am very relieved to be ending this final voyage without any major dramas such as losing the boat on some godforsaken shore in Somalia! For that I am extremely grateful. Just 4 miles to go until we reach the shelter of south side of the islands off Djibouti. Short of the pedal unit failiing I think we'll make it. Plus daylight puts a much more positive light on the picture. We're not completely out of the woods but it was certainly a different story ten hours ago with the very real possibility of getting taken south onto the reef systems east of Djibouti. We were not able to make contact with Kenny and the support boat until an hour ago, so we were essentially on our own, and the wind and waves crashing into the starboard side of the boat had me thinking that we couldn't possibily hold our latitude. 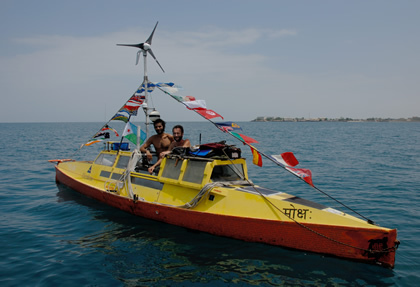 But the heros of the hour were the pedal unit (for not failing), the probably assistance from the current towards Djibouti, and above all Moksha'a amazing hull shape that allowed for the rollers to pass unhindered underneath us, lessening the degree to which we need to compensate to avoid being pushed south. She really is an amazing design. The continent of Africa is just visible to the north of us! As Sher said just a little while ago, its very seldom that one gets to arrive on a new continent by ship anymore in this age of instant air travel. Hopefully within 6 hours we will be updating this page to let you know that we have. We now have 28 miles to go, with just 19 miles to the safety of the lee side of the 'Isles Moucha'. But we have a problem - the forecast has proved deadly accurate. Less than an hour ago the wind started freshening considerably from the northwest. As I write this the sea is starting to boil all around us and the wind is beginning to whine. We are making around 2 knots which is the good news, but we are incrementally losing ground south in order to keep the boat moving forward: the more we bring her nose into the wind to avoid losing ground south, the slower we go, and the more chance there is of losing ground south etc, etc - it's a downward spiral basically. The only thing we can do is to keep her moving forward at 260 degrees, and hope that we can make the shelter of the Moucha Isles before we are taken south of the point of no return; a collection of reef systems to the east of Djibouti that would be impossible to pedal our way back around into a wind like this. And after that there's nothing between us and the Somali coast. I don't think Sher truly realises the gravity of the situation, possibly because he's never been faced with being exposed onto a weather shore - a mariners worst nightmare. But perhaps ignorance is bliss at this point. He was so elated a few hours ago when the voyage seemed in the bag, and now the tables have been turned he still seems a little unfazed by it all, regardless of my being pretty stressed out right now. As long has he pedals like hell it doesn't matter. All will be revealed in this little drama in the next 9 hours. Will update in 6. African insects are now landing on board (the first bugs we've had to deal for 6 days since leaving India) a sure sign that land is somewhere nearby over the horizon. And half an hour ago a tremendous boom shook the stillness of the ocean, presumbly from a French or American jet stationed out of Djibouti. On planet Moksha things are plugging ahead as hoped for. The southwesterly this morning didn't amount to much (thank goodness) and as I write this the sea around us is quite benign, with even a gentle swell and breeze from our stern quarter. Very nice! Earlier we even had a rain squall come overhead giving Sher his first freshwater wash in 46 days (unfortunately I was pedaling at the time so am still filthy). The most recent forecast indicates that these variable conditions will persist into this evening, by which time we should be within 30 miles of Djibouti itself. Then the dreaded northwesterly force 3 is due to kick in in the wee hours of tomorrow morning, so this is still one factor that could put the whole plan into a spin. But if we can continue this pace we might just get in behind the sheltered lee of the islands of Moucha and Maskal, 10 miles NE of Djibouti. Kenny and Nathalie are heading out to the island this evening on a hired support craft where they will spend the night and, all things being equal, rendezvous with us tomorrow morning for the final run in. This is of course entirely dependent on this damn northwesterly. In the meantime we are keeping to short, intense 1.5hr shifts. While one person keeps the pistons pumping the person at rest keeps them fueled with tea and food. Will update the situation again in 6 hours. We've been pumping like demons since the last update, slowly closing the gap to Djibouti in the knowledge that we would cross the lions share of the Gulf of Aden before wind changes to the adverse northwesterly. Then in the early hours of this morning we received some rather disheartening news from my father via SMS on the satphone to indicate that the reversal of winds from predominantly north easterly to north westerly had been brought forward. This is not good news. As of 0600 hrs GMT, in just three hours time, the wind in the ocean region we're in right now is due to start coming from the west to southwest at force 3 (10-15 knots). This would potentially halt our easterly progress entirely, with the only option being to track north for a while. Then by 1800 hrs GMT (10 hours from now), it veers around to the north, force three again (a little better), but then overnight tonight backing around to northwest 2 (not good). What all this means is that the last 60 miles could end up being a real fight with a very uncertain outcome. All hangs in the balance right now and we are completely at the mercy of the wind gods. If they are in a good mood and grant clemency then we'll be pedaling into Djibouti sometime tomorrow late morning. If not, this final furlong could end up taking several days to negotiate, and either have the boat swept down south towards the weather shores of western Somalia, or necessitate a rescue. Will update our situation in 6 hours from now. After nearly three days of tortuously slow progress the current has very much turned in our favour. Yesterday was one of the highest mileages on record for any voyage - 68.5 - thanks mainly to easterly winds blowing between 15-20 nautical miles per hour. But at the time of writing things are starting to slacken, and a change in wind direction from the northwest forecast for 48 hours from now means the success of the voyage is very much in the balance. As things stand we have to pedal like lunatics to get to Djibouti by Sunday morning to avoid potentially getting blown onto a weather shore southeast of Djibouti along the Somali coast. There are no safe harbours in this region, aside from perhaps Berbera, and the shore is renowned for heavy surf. So this is one scenario we want to avoid at all costs, hence the furious pedaling; we need to cover 140 miles in two days, which means an average of 70 miles a day, a pretty tall order considering our daily average on this voyage has been more in the 40 mile range. We will try to keep your posted of our progress. The reason for all this is a confluence of factors that are fast coming to a head: our conservative current position on the north side of the gulf (to avoid piracy); the need to now cross over to the south side for the final approach; and the wind changing direction in a little over 48 hours to a northwesterly that will put an end to any easterly progress, and the predominantly easterly direction of a 1-knot current that, as we found out a few days ago, occasionally comes from the opposite direction for no apparent reason!. Now throw in the 'cul-de-sac' effect of the eastern end of the gulf, which by its very nature puts finite limits on our options. I'd say at this point we have an even 50/50 chance of walking off the boat on Djibouti on Sunday. And there are several other 'unknowns' at this juncture that especially worry me, mainly concerning currents, that will also play a part in the eventual outcome. Kenny Brown is already on location in Djibouti ready to film for the documentary series. So if we can get within a sensible distance of Djibouti before the wind changes there's a chance he can come out with a boat to keep us being swept southeast towards Somalia. But this would precipitate a whole load of other problems, such as completing the missing section by human power, plus the added costs involved, so it really would be ideal for us to get there under our own steam. Yesterday I asked myself again, 'Why didn't I just keep things simple and ride a bike back to London from Mumbai overland through Pakistan and Iran?' This would greatly enhance the chances of successfully completing a human powered circumnavigation. But it wouldn't have served the interests of one of the other key aims of the expedition, that of seeking out adventure and living each day to its fullest. I think Sher and I have definitely managed to achieve this latter objective during the last 45 days: from breaking the rudder on the first day out, to running out of water, to struggling with the currents and facing the prospect of being taken into pirate territory around the island of Suqutra, and now the final last dash across the gulf to safety before the wind changes our fate. Never a dull moment, but I'll be relieved when we step ashore and close the chapter on this last [major] voyage of the Moksha. The counter current that had held us in its vice-like grip for almost three days finally weakened, On the surface we looked like we were moving forward: the wind was strong and pushing us from behind. However the GPS told a very different story. We were actually going backwards! With the wind from behind and pedaling it always looks like we are moving forward. Yet depending on the current the outcome can be quite different. 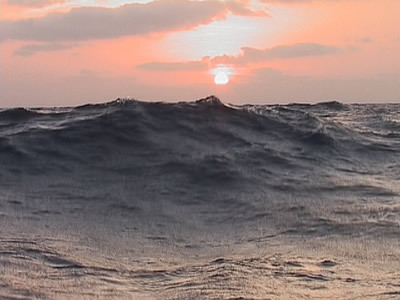 Perhaps this was the lesson from the sea for this voyage: the action is the same but the outcome is entirely different. Maybe the lesson that it was trying to impart was to focus on the task at hand rather than worrying about results. The final outcome, whatever it may be, should not be the focus. The last couple of days we've made excellent progress. With a force 3-4 wind from behind we registered 2 x 65 mile days. The waves were very big at times, almost 20 feet. Negotiating these monsters requires intense concentration. 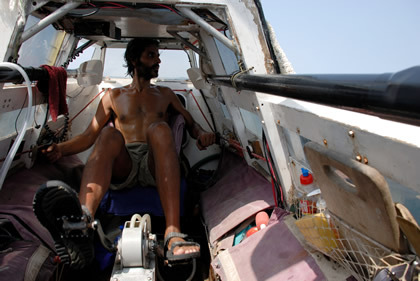 Steering Moksha with both hands on the rudder while keeping an eye on the compass needle can be exhausting, especially at night when the odd extra big 'rogue' wave will almost tip the boat over and at the very least crash over and into the cockpit, drenching everthing inside. This scenario is very possible during a momentary lapse in concentration on the part of the pedaler and can lead to a 'broach', which is when the boat is pushed by a wave faster than the rudder can be used to control the heading, and the boat slews either to the left or right and in the worst case is capsized. The really big waves produce a hissing sound on their final approach. There is a split second to react with the rudder before the boat is flung down the face of the wave at lightening speed. This reminds me of traveling down the face of a playground slide when I was a child. It is a delicate balancing act riding down the face of one of these things, and requires steering the rudder while at the same time keeping the compass needle on its mark. The last couple of nights have been intense with the wind howling and the waves crashing all around. The reward of all this has been the 60+ mile days. Moksha has handled these seas beautifully. She doesn't fight the waves, rather lets the waves slide underneath, as if to let them pass unchallenged to wrent their fury on another unsuspecting victim. Just when we thought we had the voyage in the bag a fierce counter-current has kicked in from the direction we're heading. For the last 42 hours we've been pedaling as hard as we can but the net result is that we're actually pedaling on the spot! After the high mileage days of the past week this has stopped us in dead our tracks. And the strange thing is that the conditions are about as ideal as they could get: a force 3 wind (steady 15 knots) from the stern, with following 2 metre seas pushing us consistently westwards - apparently. But looks can be very deceiving, and instead of seeing a brisk 3 knot speed on the GPS, all we're seen is the big double O! There's a lesson in all of this of course, which Sher will expound upon in the next update. But for now, we're just biding time waiting for things to turn around, trying to keep our minds diverted from the lack of miles made good so the legs can keep turning. We have witnessed an abundance of fish fauna in the coastal area that we are traveling through here in the Gulf of Aden. At the end of our pedal shifts we usually take a dip in the sea. Some days the water has seemed colder than others. On these particular days I've noticed a lot more fish under and around the boat and it has also been windier and we have noticed a strong current. What is happening is that the current and wind is blowing the surface water offshore, which is resulting in the upwelling of cold, deep water. The the result of this upwelling is this rich aray of marine life that we see flourishing around the boat. The upwelling itself is a combination of several forces: wind, the rotation of the earth and current. When the wind combined with the deflecting effects of the earth's rotation blows the surface waters offshore, the deeper water rises to replace it. A book I brought on board has been very instructive in answering many of the phenomena I have observed over the course of the voyage. This book is 'The Sea Around Us' by Rachel L. Carson. Our radar detector has been beeping nonstop these past few days. This isn't surprising considering the number of ships we've encountered since entering the Gulf of Aden. We're plum in the middle of the major shipping route for oil tankers from the Persian Gulf and container ships filled with merchandise from China stacked like dominos for consumers in Europe. We've seen all kinds of vessels: car carriers which look like giant shoe boxes, oil tankers, container ships etc. This increased volume of shipping has required us to be extra vigilant. Early yesterday morning while pedaling I spotted a ship coming up astern. It looked like it was going to pass us on our port (left) side. Having made this determination I continued pedaling. Very shortly thereafter I looked back and there it was, almost upon us! This required an immediate change of course and luckily there was sufficient to get out of it's path. Alot of these big ships don't seem keen to change course at all, so it is very important for us to get a good sense of their direction early enough to enable a change in our position accordingly. The nighttime has been particularly stressful, trying to figure out the direction of ships from their navigation lights. They also travel very fast and they'll be on top of us in just 10 minutes after first appearing on the horizon. I've had to interrupt Jason's sleep a few times to get a second opinion that one of these things will clear us. Sometimes the ocean, which looks very big, can actually seem very small, especially when you have one of these monsters is bearing down on you! We also saw an oil slick snaking it's way over the surface of the water, marring the otherwise beautifully clear blue waters that we've been pedaling through all these weeks. Yesterday we crossed the 51 degree east line of longitude marking our long anticipated and struggled-for entry into the Gulf of Aden. This is a great relief as we are now definitely on course for making it to Djibouti versus being dragged south down the east African coast with the vague hope of making landfall in Mombasa, Kenya. The occasion also marked the three quarter point of the voyage, duly celebrated with the last of the cheese, crackers and a bottle of red Sula wine that I'd completely forgotten about but rediscovered while rooting around in the sleeping compartment in search of video tape. This gives you some indication of how ridiculously healthy the life our lives have become out here - when I forget the whereabouts of a bottle of booze on board (or perhaps just how bad my memory is getting). One advantageous effect of the last major push north by the current from a few days back is that we've landed up on north side of the gulf, exactly where we planned to be at this point in the voyage in order to be as far from the north Somali coast as possible. The downside is that we're jostling for space with a mound of shipping; in any one hour of the day or night we will have two or three monster container vessels/oil tankers tracking parallel to us either heading towards or away from the Red Sea and the Suez Canal. So we are constantly scanning the horizon to keep out of their path, although our Pains Wessex Ocean Sentry radar target enhancer gives us plenty of forwarning of their whereabouts and hopefully ours to them also. A few Yemen fishing boats have crossed our path, but in general they're not as friendly as the Iranian fishing boats from a week ago. One did stop by earlier today to try and see what this floating submarine covered by dirty laundry was all about, but duly took off as soon as they saw me appear on deck without a stitch on. The old anti-piracy strategy works every time! They probably thought we were refugees from Somalia - the last thing they wanted to be taking home as the day's catch. Other than that it's business as usual - grinding out miles. The windless conditions have returned and it's now so hot that any surface of the boat not covered by shade becomes too hot to touch by mid-morning. And the pedal seat area is so stuffy that we had to inflict further surgery on the perspex canopy today, this time on the port side, in an attempt to increase air flow to the pedaler. Its always a sad moment when the last piece of fruit on board comes under the knife. Normally an orange is the last living thing to be eaten, But today, thanks largely to the wonders of genetic engineering, the winner for longevity was awarded to an apple that started off life in Washington state in the US, was transported half way around the globe to India, and eventually put on display at the fruit and veg market in Collaba, Mumbai. And the scary thing is that it looked as fresh this morning as the day I bought it over 40 days ago. Regardless of the ethics of GM (genetically modified) foods, it certainly has been a treat to have consistently crunchy and delicious fresh fruit on our morning porridge. The conditions these past 48 hours have been the best of the voyage so far with a brisk 10-15 knot wind from the stern and respectable mileages of up to 50 miles notched up on the chart each day. We could be arriving into Djibouti on the morning of the 17th or 18th at this rate. So everything seems to be moving forward in the right direction for a change. Unfortunately the same cannot be said for Sher's morning porridge which seems to be getting worse as the voyage progresses. Even the last apple couldn't save this morning's effort. WIth the consistency of a camel's nasal discharge punctuated with lumps of uncooked matter floating around in it, today's brew would be enough to prompt instant mutiny at a Siberian Gulag should the unfortunate inmates be subjected to it. Thankfully his evening dals are excellent however, so by the time you read this update all will have been forgiven for crimes committed earlier in the day in the kitchen. I am also thankful that he won't get to read this until we reach land, by which time it will be too late for him to subject me to any further culinary torture. Power is low in the batteries so this will have to be a shorty. But we wanted to send a quick update that all is well and the current that was driving us south towards the island of Suqutra over the past 48 hours has slackened considerably and we're now managing to claw back northward to our original 'safety' latitude of 15 degrees north (of the equator). The recommended clearance from Suqutra and the Somali coast is 150 nautical miles, presumably as the speedboats that these pirates use have a finite range in terms of fuel. While the threat of piracy lessens with every mile northward we regain, we can't really be sure of gaining entry in the Gulf of Aden until we're more around the 51 degree east line of longitude, still another 200 miles to the west of our position. So for now we need to keep focused and not let our guard down, which is hard because the lack of wind these past two days has us longing to leap into the water at the slightest excuse. Our bodies sweat even while pedaling at 3am, while earlier in the voyage we'd at least have respite from the heat in the nightime hours. The big news today is the watermaker failing for perhaps the last time. There was an almighty crack as Sher was pumping it this afternoon and on inspection the damage looks terminal. There are no more brass plaques to mend anything with and this crack has essentially split the entire machine in two. At the time of writing we have 90 litres remaining from the water given to us by the cargo ship MSC Eliana all those weeks ago, which should last us for around 11 days. Then there are the last resort bags of emergency water stored as ballast, which should give us another 8 days supply. So if we make it to Djibouti by the 20th, as we're on course for at our current daily mileage, we'll just scrape by. But it'll be close!